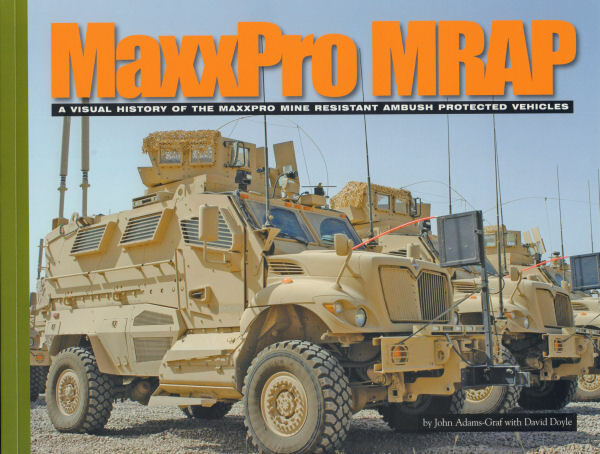 Here's the latest monograph from Ampersand Group, this time looking at the Navistar MaxxPro Mine-Resistant Armor-Protected (MRAP) vehicle. The MaxxPro was one of many MRAP designs put into production in 2007 to address the significant lack of protection provided by the Humvee and other tactical vehicles against high-powered weapons and improvised explosives used by the insurgent forces in Iraq. The MaxxPro was scaleable to meet the Cat I and Cat II requirements and unlike many of the other MRAPS that were hastily deployed to fill the soldier-protection need, the MaxxPro is one of the few types that remains in active duty service. This title looks at the evolution of the MaxxPro in its various mission configurations as well as modernized capabilities. The title is full of color photos that are well-captioned to help the reader understand what they are looking at and the selection of photos provide a nice detailed look around the exterior of several variants. The only down side to this title is the lack of interior photos, but you can no-doubt understand that the military doesn't want to give away the capabilities inside the various versions of this tactical vehicle. I was pleased to see an old friend in this title - EC-130H 73-1587 is shown parked next to a Marine Corps MaxxPro as the crews pose for a photo while the airmen get acquainted with the Marines' mission and the Marines get acquainted with the Compass Call mission. Whether you are looking for a good detail reference for the Trumpeter 1/16 MaxxPro kit or the Kinetic 1/35 kit, this title will give you a good look at the different configurations and external details of the MaxxPro in the field. Definitely recommended! My sincere thanks to Ampersand Group for this review sample!